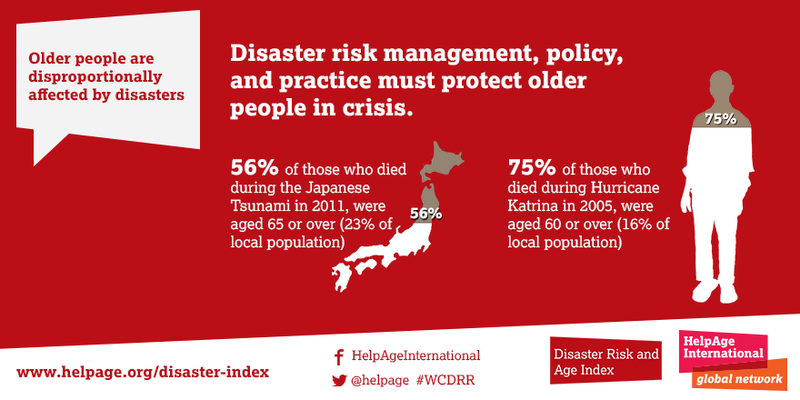 HelpAge International is launching the first Disaster Risk and Age Index, which ranks 190 countries according to the disaster risk faced by older people. The Index reflects the collision of two trends in our current world: ageing populations and greater risk from natural and technological hazards. Older people are especially vulnerable in disasters, natural or manmade. In the 2011 Japanese tsunami, 56% of those who died were aged 65 and over although this age group made up only 23% of the population. Similarly in 2005’s Hurricane Katrina in the US, 75% of those who died were 60+ even though that age group only made up 16% of the local population. Overall, those in Somalia, Central African Republic and Afghanistan face the highest risk, due in part to ongoing conflicts along with a lack of services available to older men and women. At the other end of the spectrum, older people in Malta and Finland are exposed to the lowest risk from disasters. The report also has an in-depth focus on South and East Asia since that region has some of the highest disaster and climate change related risks as well as the fastest ageing populations. ← Our Stories, Their Stories.